← What Kinds of Routines Does Your Senior Loved One Need? Older adults typically do not only need elderly homecare providers to assist with household chores, meal preparations, and medication reminders. Sometimes they also need to help with the personal care tasks, which include bathing, brushing teeth, and toileting. This can be a difficult task for most caregivers, especially if they are family members. These tips will help you provide the personal care your loved one needs, while keeping their dignity intact. Put yourself in their shoes. The thought of having a family member help bathe them is probably not something they look forward to. In fact, most seniors are probably embarrassed that they need help. Try to be compassionate towards your loved one, realizing that you helping with their personal care is probably more difficult for them than it is for you. Create a peaceful environment. To ensure that your loved one is not stressed during this experience, try to create a relaxing environment for them. Consider using tranquil music and dim lighting to help ease their embarrassment or stress. Let them make decisions. Is there a certain time the elder prefers to take his bath? If they do and it will not disrupt any other part of their routine, then allow them to choose the time. Early on in your caregiving role, sit down with the elder to discuss their bathing habits and the time and frequency they would like to use. This will clear up any confusion down the road. Encourage independence. If there is something your loved one is able to do alone, let them. The more independent you allow them to be, the more they will be able to live alone. If the senior would like to continue being independent, but they have a condition that makes holding a sponge or toothbrush difficult, there are plenty of tools available that will make doing these tasks easier for the senior. Have a plan. 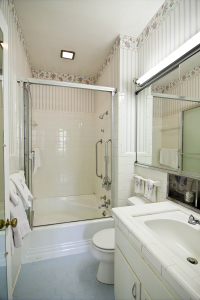 Before taking your loved one to the bathroom to prepare for their shower or bath, prepare the room. Place the towels and wash cloths near the bathtub, while also putting the shampoo and soap in an easy-to-reach spot. The more prepared you are, the less stressful this task will be. Bathing an elderly parent can be an embarrassing experience for both of you. However, by following these tips and getting a little help from an elderly homecare provider, you will be able to effectively provide the personal care the elder is in need of. For Homecare Services in Bartlett TN, please contact the caring staff at Personal Care Services MidSouth today! This entry was posted in Homecare Bartlett TN and tagged Homecare Bartlett TN. Bookmark the permalink.